How did you and Hart Seely first meet and start working together? Oh, it was decades ago. I always loved journalism – Clark Kent, you know – I mean, I loved Superman so much I subscribed to The Columbia Journalism Review in my twenties. Pretty bad case. So when I started bumping into reporters for the local Syracuse dailies who were close to me in age, I shamelessly elbowed my way into their social scene. I think the first party I got invited to, Hart was there, and we clicked. Just throwing around the jokes. The guy was incredibly funny, and I was trying hard to be. Within a couple of years, we were writing humor pieces together and sending them to magazines. We had a few successes, nothing life-changing. But it was fun. Several years after that, I got hired at DC Comics and left Syracuse for New York City. Still devoted to humor writing, Hart wasted no time lining up my younger replacement, cartoonist Frank Cammuso. Naturally I tried to sabotage their partnership, but it was impossible to do long distance. So I came to accept Frank in time. Smash cut to the 21st Century! Hart retired from journalism and was looking for something interesting to do. Since Frank and I are in comics, he got the idea to set up this company and see where we can take it. What was it about the idea of a comic magazine vs a comic book that appealed to you? We were looking through old comics for things that aren’t done anymore that might be promising. And we came to these text stories that predated letter columns. They had to include a page or three of text to qualify for reduced postal rates, so they would pay a little money for someone to write a little adventure story as fast as possible. Or it least they read like that. So we thought, what if these were good? The idea kind of exploded from there. We’d have two, three text pieces in the back, and they could be fiction, humor, interviews, poems. It would solve a problem for readers who felt like 10 minutes of reading didn’t justify the going price tag, and it would help set us apart. And we could work with some good writers and illustrators from outside of comics. So that’s how we kind of backed into it. It was a stroke of cosmic luck that Grant Morrison was ready to help us launch this idea with three perfect stories. 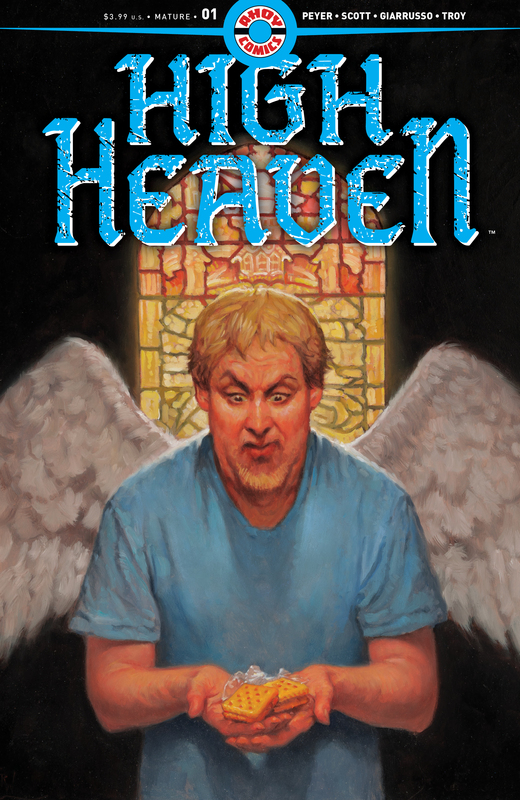 You’re writing three comics for AHOY – The Wrong Earth, High Heaven, and Hashtag: Danger. Were these new ideas? Had you been kicking around them for a while? I had The Wrong Earth and High Heaven kicking around in my head for a couple of years, but they were pretty formless until I actually sat down to work on them for AHOY. I had intended to pitch The Wrong Earth to an existing property at another company, but now I’m glad I didn’t, especially since we ended up working with Jamal Igle. Hashtag: Danger was just a name until we decided it would be good to have a backup in High Heaven that felt completely different from the main story. 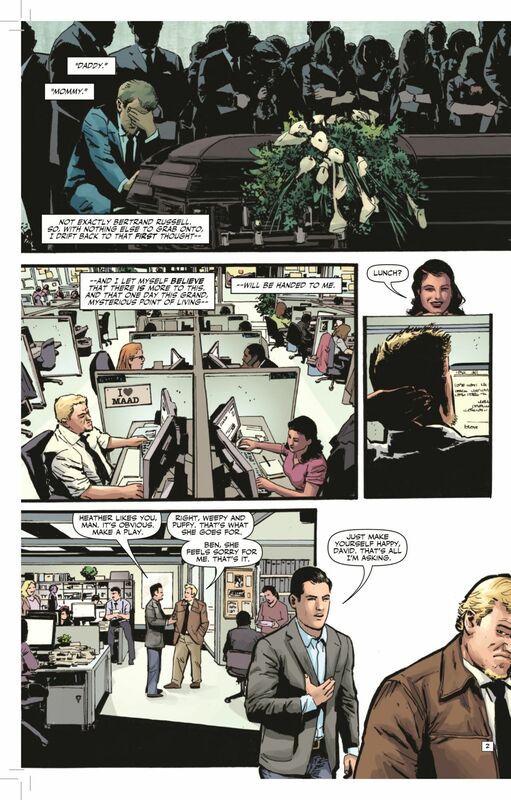 Besides writing, you’re also the editor in chief of AHOY Comics. You’ve been working in comics for a while, and I’m curious who or what did you really want or really need as you were putting things together? Last week I got physical copies of The Wrong Earth #1 and it felt and looked so good to me. While I was cradling it I realized it’s the first comic I’d edited in 25 years. What we all wanted the whole time was a comic that looked good and professional enough to be published by a major company while being something they probably wouldn’t publish. 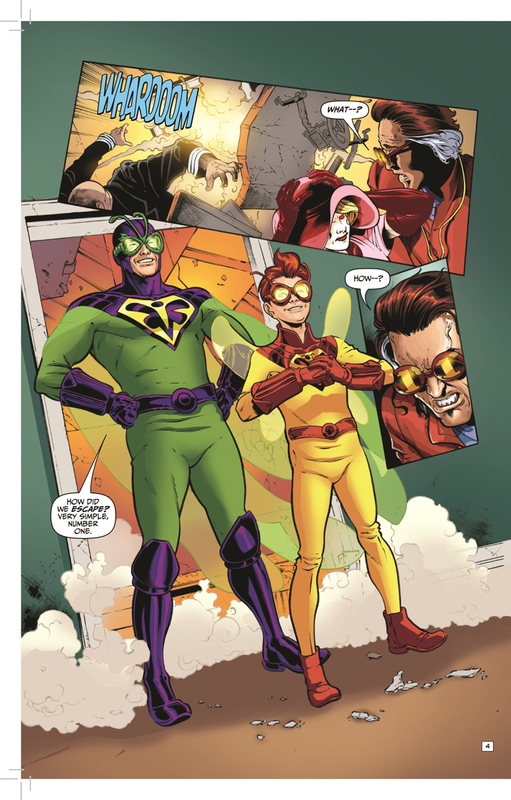 The Wrong Earth is a super-hero satire that doesn’t depend on other superhero comics to make sense; they’re not doing those. I suppose Vertigo or someone might do something like High Heaven, but I don’t see them pairing it with anything silly like Hashtag: Danger. So that was what we wanted. What we needed were professionals who work up to a high standard and fit with some of the less conventional choices we made, and bring their own weird ideas. Greg Scott, Jamal, Grant, Andy Troy, Richard Williams, Chris Giarrusso, Rachel Pollack, Rick Geary, Ann Nocenti, Mark Russell, Peter Snejbjerg. We needed people like that, and we got those very people. Was the plan for you to tell three very different stories, three different kinds of stories with three very different artists and approaches? Yeah. 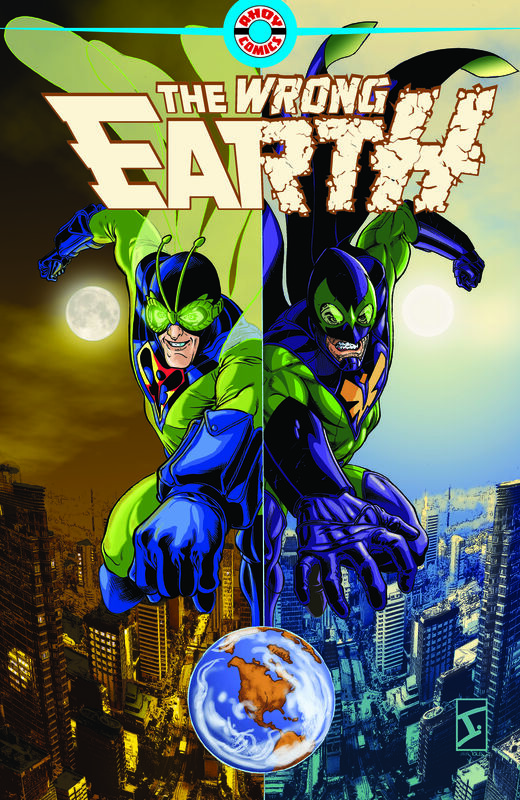 The two titles we’re releasing in our first launch month, The Wrong Earth and High Heaven (by Greg Scott and me), couldn’t be more different. One’s a super-hero satire and the other is a bleak comedy that has nothing to do with comics or heroes or anything like that. In October we’re launching Captain Ginger, a space opera with cats by Stuart Moore and June Brigman; and Edgar Allan Poe’s Snifter of Terror, a comedy horror anthology. They’re all funny, all beautifully drawn, and the resemblance ends there. I always liked variety and surprise more than the idea of a house style. You’ve written plenty of superhero comics over the years and The Wrong Earth in a lot of ways feels like you taking both trying to deconstruct and celebrate some of what you like about superheroes. Is that fair? It is. I’d like to keep doing superhero stories – I love them – but I’m not so interested anymore in stories that turn on the question, “Will the hero beat the villain?” There’s so much else to explore. 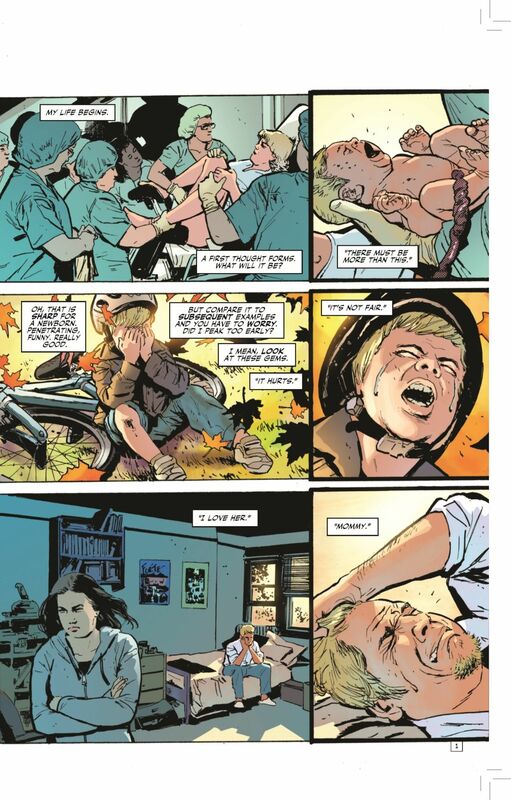 I learned a lot from Mark Waid’s example; he’s always had this uncanny ability to read the most childish old super-hero story and pick out the dramatic elements that made it real. He’ll walk you through a Legion of Substitute Heroes story and it’s like he’s breaking down an Edward Albee play. Grant’s a big influence, too; he could take any superhero trope and make it hilarious in an original way, find the joke no one’s telling. The Wrong Earth and High Heaven are both absurd and satirical but they’re not necessarily funny. You play the situations very straight and seriously. To me, the funniest humor is told with a straight face. On TV, for example, something like Better Call Saul or Fargo is way funnier than some laugh-track sitcom that needs to stop the story for a wisecrack every 20 seconds. The best humor comes from setting up characters and seeing what they do, how they can’t help being themselves. A long time ago, the writer Michael O’Donoghue said, “Making people laugh is the lowest form of comedy,” and I’m starting to see what he might have meant. What is Hashtag: Danger? And why did you want to make a backup story, because they aren’t done much anymore. It’s like the text stories and poems, We’re trying to stand out by giving readers something they can spend time with. I love backup stories anyway. Supergirl in Action Comics, Stumbo the Giant in Hot Stuff; it feels extravagant to get this whole other character to read about. These are old examples and we’re not trying to be some nostalgia enterprise. But there are things that have fallen away that could still be used to good effect, like the text stories. Hashtag: Danger is about of team of scientific adventures charged with finding fantastic phenomena in case there’s money to be made. 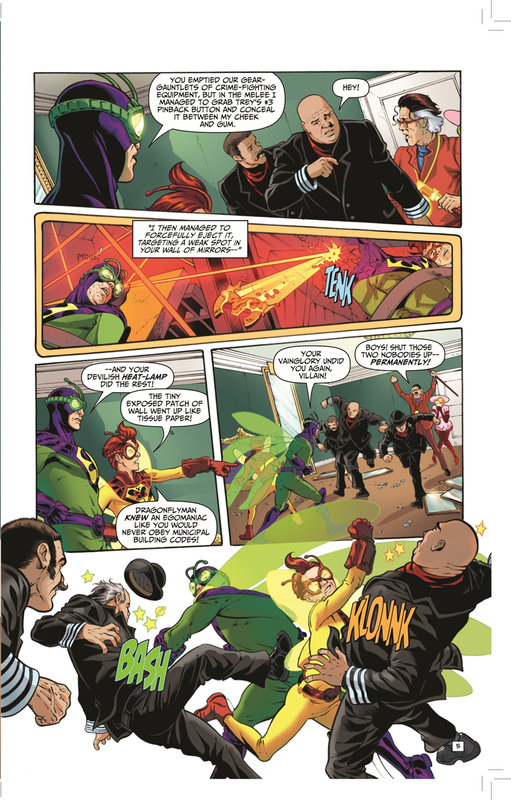 It comes in five-page installments with a simple structure: usually two pages of pulpy adventure followed by three pages of the heroes being dicks to each other. They have high tech, they wear jumpsuits, they each have particular skills, but they’re not all there for the same reason and they’ve usually had it with each other. What really sells it is Chris Giarrusso’s hilarious, adorable, cartoony art. It’s a pretty long way from Greg Scott’s naturalistic High Heaven art. You mentioned that next month you’re launching an anthology series. Do you want to say a little about the book and who’s involved? Edgar Allan Poe’s Snifter of Terror adapts mostly Poe stories irreverently; you could even say snidely. Poe himself appears as your horror host, drunkenly slurring his way through endlessly digressive introductions. Our first couple of issues feature work by Mark Russell, Rachel Pollack, Rick Geary, Peter Snejbjerg, Fred Harper, and me. Stuart Moore and Ryan Kelly adapt a Jules Verne story in #2, contrarians that they are. Covers are by MAD‘s eighth-maddest artist, Richard Williams (who also paints High Heaven covers). And every issue features the great Hunt Emerson doing a slapstick take on Poe vs.The Black Cat. You were an artist when you were younger, do I have that right? You were also a political cartoonist. Any interest in these fraught and complicated political times of doing it again? Or do you think, thank god I changed careers? I wouldn’t call it a career, but I held my little spot in the Syracuse New Times for a dozen years. And I really, really, really wouldn’t want to be doing it now. It’s like the entire culture has assimilated political cartoons like the Borg. We are bombarded with jokes about politics from every direction all day and all night. I don’t know how a cartoonist could possibly make a fresh point, or stand out at all. Plus, I never liked my own drawings. This is better.